35 designs for Christmas Tree ornaments that utilize your scrap glass. Quick & easy patterns make these great afternoon projects. Tree ornaments make great gifts and sell fast at craft shows. Most projects shown in color. Wonderful full-size patterns of stand up angels, trees, ornaments, wreaths, freestanding bells, candles, snowman, a train, a sled, a stocking, a poinsettia, a drum, and a nativity scene. 36 pages. 15 color photos. One unique project is a nativity scene with a south west theme. Other projects include freestanding angels, large and small, a traditional nativity set and window decorations created in brass rings. all are constructed using the convenient lead-wrap method. Stained glass door wreaths for all occasions. Designs include all four seasons, Christmas, Halloween, Easter, St. Patricks Day, 4th of July, Valentines. Other designs include summer, winter, spring, and fall themes. 66 Full size templates represent a dozen holidays and occasions. Patterns include stars, snowflakes, Santas, bells, Christmas wreaths, birthday candles, shamrocks, hearts, turkeys, Halloween pumpkins, and Easter eggs in a basket. 17 patterns that represent the winter holidays. Designs include a gift box, candy canes, Christmas ornaments, seasonal teddy Bear, snowman, Santa, puppy in a stocking, Christmas Bells, Angels, poinsettia, bows and a Christmas Tree. Each pattern is shown in full color and color suggestions are included. Designs can also be used in panels and free-form projects. 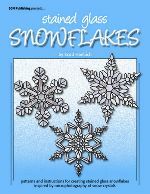 Includes 12 full size, color patterns for Santas in their original old world costumes. You'll find Eastern European Santas from the late 1800's, an Old English Father Christmas from 1905, a German St. Nicholas from 1908 and an American Santa from 1925. All of the Santas have colorful outfits accented by a variety of toys, trees, bells and wreaths. 10 patterns inspired by photographs of snow crystals. Every snowflake that falls from the sky has a unique crystalline design. These patterns are inspired by actual microphotography of these remarkable masterpieces of nature. You can hang them in your windows and admire each one-of-a-kind creation any time of the year. For maximum sparkle, it is suggested that these snowflakes be constructed with a variety of textures of clear glass but you can also use pale cathedral colors or some brightly colored glass if you want a more contemporary (albeit surreal) look. 12 holiday designs. 4 small window panels, 3-D projects include a lighted tree, 2 angel tree toppers, Santa in his sleigh pulled by flying reindeer, a Nativity nightlight, fireplace candleholder, Santa cardholder & Christmas package napkin holder. Instructions & color photos included. 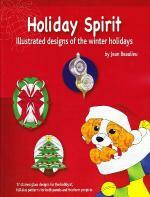 Projects in this book celebrate Winter and all that the season brings. Designs include icicles, Christmas window ornaments, snow family candleholders, a nativity scene and tree top ornaments suitable for use with artificial Christmas trees.